Just taking a short break from work I chatted over coffee to one of the students here at the Niels Bohr Institute about various things to do with the analysis of signals in the Fourier domain (as you do). That discussion reminded me of this rather old post (from 2009) which I thought might be worth a second airing (after a bit of editing). The discussion is all based on past cosmological data (from WMAP) rather than the most recent (from Planck), but that doesn’t change anything qualitatively. So here you are. 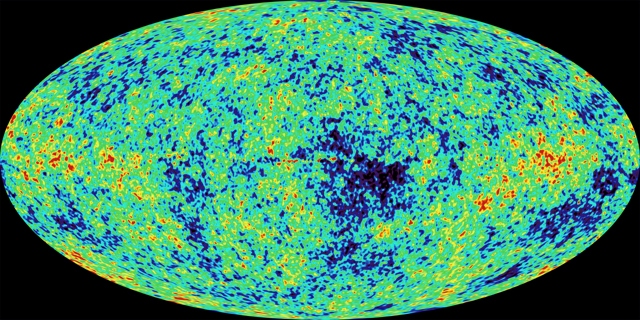 The picture above shows the all-sky map of fluctuations in the temperature of the cosmic microwave background across the sky as revealed by the Wilkinson Microwave Anisotropy Probe, known to its friends as WMAP. I spent many long hours fiddling with the data coming from the WMAP experiment, partly because I’ve never quite got over the fact that such wonderful data actually exists. 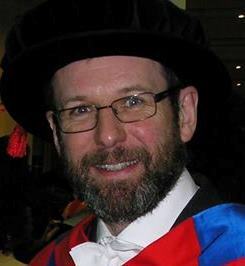 When I started my doctorate in 1985 the whole field of CMB analysis was so much pie in the sky, as no experiments had yet been performed with the sensitivity to reveal the structures we now see. This is because they are very faint and easily buried in noise. The fluctuations in temperature from pixel to pixel across the sky are of order one part in a hundred thousand of the mean temperature (i.e. about 30 microKelvin on a background temperature of about 3 Kelvin). That’s smoother than the surface of a billiard ball. That’s why it took such a long time to make the map shown above, and why it is such a triumphant piece of science. I blogged a while ago about the idea that the structure we see in this map was produced by sound waves reverberating around the early Universe. The techniques cosmologists use to analyse this sound are similar to those used in branches of acoustics except that we only see things in projection on the celestial sphere which requires a bit of special consideration. One of the things that sticks in my brain from my undergraduate years is being told that `if you don’t know what you’re doing as a physicist you should start by making a Fourier transform of everything. This approach breaks down the phenomenon being studied into a set of plane waves with different wavelengths corresponding to analysing the different tones present in a complicated sound. It’s often very good advice to do such a decomposition for one-dimensional time series or fluctuation fields in three-dimensional Cartesian space, even you do know what you’re doing, but it doesn’t work with a sphere because plane waves don’t fit properly on a curved surface. Fortunately, however, there is a tried-and-tested alternative involving spherical harmonics rather than plane waves. This latter representation is the most useful one for CMB fluctuations because the simplest versions of inflationary theory predict that the phases φ of each of the spherical harmonic modes should be randomly distributed. What this really means is that there is no information content in their distribution so that the harmonic modes are in a state of maximum statistical disorder or entropy. This property also guarantees that the distribution of fluctuations over the sky should have a Gaussian distribution. Although the units on the axes are a bit strange it doesn”t require too much imagination to interpret this in terms of a sound spectrum. There is a characteristic tone (at the position of the big peak) plus a couple of overtones (the bumps at higher frequencies). However these features are not sharp so the overall sound is not at all musical. If the Gaussian assumption is correct then the power-spectrum contains all the useful statistical information to be gleaned from the CMB sky, which is why so much emphasis has been placed on extracting it accurately from the data. Conversely, though, the power spectrum is completely insensitive to any information in the distribution of spherical harmonic phases. If something beyond the standard model made the Universe non-Gaussian it would affect the phases of the harmonic modes in a way that would make them non-random. You can see the major mountain ranges (Andes, Himalayas) quite clearly as red in this picture and note how high Antarctica is…that’s one of the reasons so much astronomy is done there. Now, using the same colour scale we have the WMAP data again (in Galactic coordinates). The virture of this representation of the map is that it shows how smooth the microwave sky is compared to the surface of the Earth. Note also that you can see a bit of crud in the plane of the Milky Way that serves as a reminder of the difficulty of cleaning the foregrounds out. Clearly these two maps have completely different power spectra. The Earth is dominated by large features made from long-wavelength modes whereas the CMB sky has relatively more small-scale fuzz. Now I’m going to play with these maps in the following rather peculiar way. First, I make a spherical harmonic transform of each of them. This gives me two sets of complex numbers, one for the Earth and one for WMAP. Following the usual fashion, I think of these as two sets of amplitudes and two sets of phases. Note that the spherical harmonic transformation preserves all the information in the sky maps, it’s just a different representation. This map has exactly the same amplitudes for each mode as the WMAP data and therefore possesses an identical power spectrum to that shown above. Clearly, though, this particular CMB sky is not compatible with the standard cosmological model! Notice that all the strongly localised features such as coastlines appear by virtue of information contained in the phases but absent from the power-spectrum. To understand this think how sharp features appear in a Fourier transform. A sharp spike at a specific location actually produces a broad spectrum of Fourier modes with different frequencies. These modes have to add in coherently at the location of the spike and cancel out everywhere else, so their phases are strongly correlated. A sea of white noise also has a flat power spectrum but has random phases. The key difference between these two configurations is not revealed by their spectra but by their phases. Fortunately there is nothing quite as wacky as a picture of the Earth in the real data, but it makes the point that there are more things in Heaven and Earth than can be described in terms of the power spectrum! Finally, perhaps in your mind’s eye you might consider what it might look lie to do the reverse experiment: recombine the phases of WMAP with the amplitudes of the Earth. If the WMAP data are actually Gaussian, then this map is a sort of random-phase realisation of the Earth’s power spectrum. Alternatively you can see that it is the result of running a kind of weird low-pass filter over the WMAP fluctuations. The only striking things it reveals are (i) a big blue hole associated with foreground contamination, (ii) a suspicious excess of red in the galactic plane owing to the same problem, and (iiI) a strong North-South asymmetry arising from the presence of Antarctica. PS. These pictures were made by a former PhD student of mine, Patrick Dineen, who has since quit astrophysics to work in the financial sector for Winton Capital, which has over the years recruited a number of astronomy and cosmology graduates and also sponsors a Royal Astronomical Society prize. That shows that the skills and knowledge obtained in the seemingly obscure field of cosmological data analysis have applications elsewhere! We compute the complex 3D Fourier transform of the spatial galaxy distribution in a volume-limited sample of the Sloan Digital Sky Survey redshift survey. The direct unbinned transform yields results quite similar to those from the Fast Fourier Transform (FFT) of finely binned galaxy positions. In both cases deconvolution of the sampling window function yields estimates of the true 3D transform. The Fourier amplitudes resulting from this simple procedure yield power spectrum estimates consistent with those from other much more complicated approaches. We demonstrate how the corresponding Fourier phase spectrum lays out a simple and complete characterization of non-Gaussianity that is more easily interpretable than the tangled, incomplete multi-point methods conventionally used. Measurements based on the complex Fourier transform indicate departures from exact homogeneity and isotropy at the level of ∼1% or less. Our model-independent analysis avoids statistical interpretations, which have no meaning without detailed assumptions about a hypothetical process generating the initial cosmic density fluctuations. It’s obviously an excellent piece of work because it cites a lot of my papers! But seriously I think it’s very exciting that we now have data sets of sufficient size and quality to allow us to go beyond the relatively crude statistical description provided by the power spectrum. As I threatened promised after Anton’s interesting essay on the perception of colour, a couple of days ago, I thought I’d write a quick item about something vaguely relevant that relates to some of my own research. In fact, this ended up as a little paper in Nature written by myself and Lung-Yih Chiang, a former student of mine who’s now based in his homeland of Taiwan. This is going to be a bit more technical than my usual stuff, but it also relates to a post I did some time ago concerning the cosmic microwave background and to the general idea of the cosmic web, which has also featured in a previous item. You may find it useful to read these contributions first if you’re not au fait with cosmological jargon. The large-scale structure of the Universe – the vast chains of galaxies that spread out over hundreds of millions of light-years and interconnect in a complex network (called the cosmic web) – is thought to have its origin in small fluctuations generated in the early universe by quantum mechnical effects during a bout of cosmic inflation. where is the amplitude and is the phase belonging to the wavevector ; the phase is an angle between zero and radians. This is a particularly useful thing to do because the simplest versions of inflation predict that the phases of each of the Fourier modes should be randomly distributed. Each is independent of the others and is essentially a random angle designating any point on the unit circle. What this really means is that there is no information content in their distribution, so that the harmonic components are in a state of maximum statistical disorder or entropy. This property also guarantees that fluctuations from place to place have a Gaussian distribution, because the density contrast at any point is formed from a superposition of a large number of independent plane-wave modes to which the central limit theorem applies. However, this just describes the initial configuration of the density contrast as laid down very early in the Big Bang. As the Universe expands, gravity acts on these fluctuations and alters their properties. Regions with above-average initial density ( ) attract material from their surroundings and get denser still. They then attract more material, and get denser. This is an unstable process that eventually ends up producing enormous concentrations of matter ( ) in some locations and huge empty voids everywhere else. This process of gravitational instability has been studied extensively in a variety of astrophysical settings. There are basically two regimes: the linear regime covering the early stages when and the non-linear regime when large contrasts begin to form. The early stage is pretty well understood; the latter isn’t. Although many approximate analytical methods have been invented which capture certain aspects of the non-linear behaviour, general speaking we have to run N-body simulations that calculate everything numerically by brute force to get anywhere. The difference between linear and non-linear regimes is directly reflected in the Fourier-space behaviour. In the linear regime, each Fourier mode evolves independently of the others so the initial statistical form is preserved. In the non-linear regime, however, modes couple together and the initial Gaussian distribution begins to distort. About a decade ago, Lung-Yih and I started to think about whether one might start to understand the non-linear regime a bit better by looking at the phases of the Fourier modes, an aspect of the behaviour that had been largely neglected until then. Our point was that mode-coupling effects must surely generate phase correlations that were absent in the initial random-phase configuration. In order to explore the phase distribution we hit upon the idea of representing the phase of each Fourier mode using a colour model. Anton’s essay discussed the RGB (red-green-blue) parametrization of colour is used on computer screens as well as the CMY (Cyan-Magenta-Yellow) system preferred for high-quality printing. However, there are other systems that use parameters different to those representing basic tones in these schemes. In particular, there are colour models that involve a parameter called the hue, which represents the position of a particular colour on the colour wheel shown left. 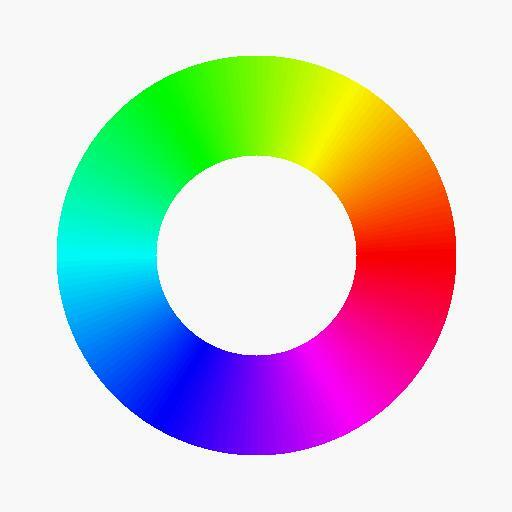 In terms of the usual RGB framework you can see that red has a hue of zero, green is 120 degrees, and blue is 240. The complementary colours cyan, magenta and yellow lie 180 degrees opposite their RGB counterparts. This representation is handy because it can be employed in a scheme that uses colour to represent Fourier phase information. Our idea was simple. The phases of the initial conditions should be random, so in this representation the Fourier transform should just look like a random jumble of colours with equal amounts of, say, red green and blue. As non-linear mode coupling takes hold of the distribution, however, a pattern should emerge in the phases in a manner which is characteristic of gravitational instability. I won’t go too much further into the details here, but I will show a picture that proves that it works! What you see here are four columns. 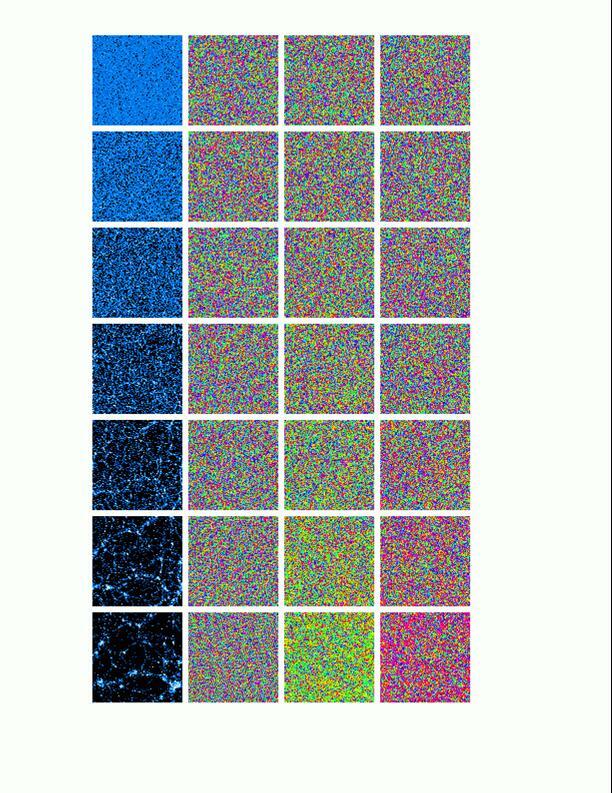 The leftmost shows (from top to bottom) the evolution of a two-dimensional simulation of gravitational clustering. You can see the structure develops hierarchically, with an increasing characteristic scale of structure as time goes on. The second column shows a time sequence of (part of) the Fourier transform of the distribution seen in the first; for the aficianados I should say that this is only one quadrant of the transform and that the rest is omitted for reasons of symmetry. Amplitude information is omitted here and the phase at each position is represented by an appropriate hue. To represent on this screen, however, we had to convert back to the RGB system. The pattern is hard to see on this low resolution plot but two facts are noticeable. One is that a definite texture emerges, a bit like Harris Tweed, which gets stronger as the clustering develops. The other is that the relative amount of red green and blue does not change down the column. The reason for the second property is that although clustering develops and the distribution of density fluctuations becomes non-Gaussian, the distribution of phases remains uniform in the sense that binning the phases of the entire Fourier transform would give a flat histogram. This is a consequence of the fact that the statistical properties of the fluctuations remain invariant under spatial translations even when they are non-linear. Although the one-point distribuition of phases stays uniform even into the strongly non-linear regime, they phases do start to learn about each other, i.e. phase correlations emerge. Columns 3 and 4 illustrate this in the simplest possible way; instead of plotting the phases of each wavemode we plot the differences between the phases of neighbouring modes in the x and y directions respectively. If the phases are random then the phase differences are also random. In the initial state, therefore, columns 3 and 4 look just like column 2. However, as time goes on you should be able to see the emergence of a preferred colour in both columns, showing that the distribution of phase differences is no longer random. The hard work is to describe what’s going on mathematically. I’ll spare you the details of that! But I hope I’ve at least made the point that this is a useful way of demonstrating that phase correlations exist and of visualizing some of their properties. It’s also – I think – quite a lot of fun! P.S. If you’re interested in the original paper, you will find it in Nature, Vol. 406 (27 July 2000), pp. 376-8. The picture above shows the latest available all-sky map of fluctuations in the temperature of the cosmic microwave background across the sky as revealed by the Wilkinson Microwave Anisotropy Probe, known to its friends as WMAP. I’ve spent many long hours fiddling with the data coming from the WMAP experiment, partly because I’ve never quite got over the fact that such wonderful data actually exists. When I started my doctorate in 1985 the whole field of CMB analysis was so much pie in the sky, as no experiments had yet been performed with the sensitivity to reveal the structures we now see. This is because they are very faint and easily buried in noise. The fluctuations in temperature from pixel to pixel across the sky are of order one part in a hundred thousand of the mean temperature (i.e. about 30 microKelvin on a background temperature of about 3 Kelvin). That’s smoother than the surface of a billiard ball. That’s why it took such a long time to make the map shown above, and why it is such a triumphant piece of science. I blogged a few days ago about the idea that the structure we see in this map was produced by sound waves reverberating around the early Universe. The techniques cosmologists use to analyse this sound are similar to those used in branches of acoustics except that we only see things in projection on the celestial sphere which requires a bit of special consideration. One of the things that sticks in my brain from my undergraduate years is being told that if a physicist doesn’t know what they are doing they should start by making a Fourier transform. This breaks down the phenomenon being studied into a set of independent plane waves with different wavelengths corresponding to the different tones present in a complicated sound. Spherical harmonics are quite complicated beasts mathematically but they have pretty similar properties to Fourier harmonics in many respects. In particular they are represented as complex numbers having real and imaginary parts or, equivalently, an amplitude and a phase (usually called an argument by mathematicians). The latter representation is the most useful one for CMB fluctuations because the simplest versions of inflation predict that the phases of each of the spherical harmonic modes should be randomly distributed. What this really means is that there is no information content in their distribution so that the harmonic modes are in a state of maximum statistical disorder or entropy. This property also guarantees that the distribution of fluctuations over the sky should have a Gaussian distribution. Although the units on the axes are a bit strange it doesn”t require too much imagination to interpret this in terms of a sound spectrum. There is a characteristic tone (at the position of the peak) plus a couple of overtones. However these features are not sharp so the overall sound is not at all musical. Conversely, though, the power spectrum is completely insenstive to any information in the distribution of spherical harmonic phases. If something beyond the standard model made the Universe non-Gaussian it would affect the phases of the harmonic modes in a way that would make them non-random. So far, so good. It sounds like it should be a straightforward job to work out whether the WMAP phases are random or not. Unfortunately, though, this task is heavily complicated by the presence of noise and systematics which can be quite easily cleaned from the spectrum but not from more sophisticated descriptors. All we can say so far is that the data seem to be consistent with a Gaussian distribution. The virture of this map is that it shows how smooth the microwave sky is compared to the surface of the Earth. Note also that you can see a bit of crud in the plane of the Milky Way that serves as a reminder of the difficulty of cleaning the foregrounds out. There’s no great scientific result here, just a proof that spherical harmonics can be fun. PS. These pictures were made by a former PhD student of mine, Patrick Dineen, who has since quit astronomy to work in high finance. I hope he is weathering the global financial storm!